The Republic of Turkey has traditionally been a country possessing a large army yet unwilling to become directly involved in military confrontations. 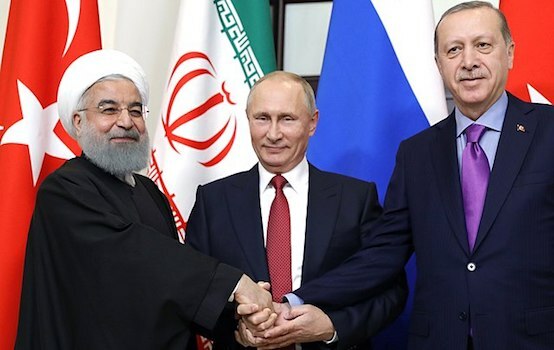 But this situation has now apparently come to an end as President Erdoğan and the wily PM Davutoğlu now seem willing to employ any means possible to become a leading component of a new Middle East. On 15 December 2015, the Kingdom of Saudi Arabia unveiled its desire to create an “Islamic military alliance to fight terrorism”, a 34-nation coalition, including such military high-rollers like Turkey and Pakistan, with its “joint operations center” to be located in the Saudi capital of Riyadh. King Salman’s men have devised this project “for the sake of supporting international efforts to combat terrorism and to save international peace and security”. In addition, the Saudi press release indicates that “[m]ore than ten other Islamic countries have expressed their support for this alliance and will take the necessary measures in this regard, including Indonesia“. In other words, while the U.S.-led coalition of the NATO-wiling (basically Germany, France, the UK, albeit also assisted by Turkey, Qatar and Saudi Arabia) is bombing the Islamic State in various locations throughout Iraq and Syria, the Sunni bloc-under-Wahhabi-leadership has now also decided to join the fray in its own right. This could arguably be seen as an effort to produce a kind of homegrown military response to extremists unsettling the status quo and threatening the world beyond the wider Middle East. The next day, the Secretariat General of the Muslim World League (MWL) expressed its support for the initiative as a way of bestowing further legitimacy on King Salman’s attempt to join the U.S. in its continuing war-games in the Middle East (and further afield). But the “Islamic military alliance to fight terrorism” was announced but five days after the conclusion of a largely inconclusive two-day meeting of Syrian opposition groups in Riyadh, a meeting that was meant to unify the anti-Assad opposition. The Saudi foreign minister Adel Al-Jubeir stated that the goal had been to bring together as “broad a cross-section of Syrian opposition groups as possible”. Alas, the important player Ahrar al-Sham withdrew from the meeting, declaring publicly that “[a]s we withdraw from the conference, we are calling on other Mujahedeen and revolutionary groups to make a historic stance on the side of their religion, nation and people. [Other groups] must take into consideration the sacrifices that were made to achieve their goals.” Thus, It seems that the Saudi failure to create a unified front of non-state actors opposing Bashar al-Assad has now led to the projected creation of an alliance of Sunni states that oppose the Damascus regime and its backers. Does this mean that King Salman has now effectively created a Sunni military alliance willing to meddle in the intra-Islamic Cold War between the Wahhabi-led Sunni bloc and the Shi’ite faction? This officially undeclared conflict at the moment appears to possess three separate proxy-battlefronts stretching from Syria over Iraq into Yemen, but that can really be reduced to the Saudi enmity to the Islamic Republic of Iran, an antagonism that has come into its own following the disappearance of Saddam Husain and the subsequent power-vacuum created by the Bush invasion and occupation of Iraq. The fact that Turkey is part of this Saudi-led effort seems somewhat ironic; firstly, because Ankara is the one and only Muslim member of the North Atlantic Treaty Organization and secondly, because the AKP-led government appears to largely support the grouping Ahrar al-Sham that so blatantly doomed the two-day meeting to failure. Still, Riyadh and Ankara also appear to be the two largest importers of U.S.-made weaponry and therefore, the “Islamic military alliance to fight terrorism” will in large measure benefit the Military-Industrial Complex that seems to support the U.S. political system, irrespective of whomever occupies the White House. Business comes first and “war is a racket” after all, to quote Major General Smedley Butler’s informative and incisive 1935 eponymous little booklet. According to data provided by the Stockholm International Peace Research Institute (SIPRI) earlier this year, Turkey spent a whopping $1,081,000,000 on importing weapons from U.S. manufacturers last year. And this massive investment was apparently made with a specific goal in mind. Last summer, Turkey joined the U.S.-led anti-ISIS coalition with a lot of fanfare, even though its actual attacks on IS positions appear limited. But now, the Reuters‘ news agency reports that Turkey’s ambassador to Qatar Ahmet Demirok has come out to declare that “three thousand ground troops would be stationed at” a Turkish military base in Qatar, including air and naval units, military trainers and special operations forces — “Turkey’s first overseas military installation in the Middle East”. Demirok elaborated that “Turkey and Qatar face common problems and we are both very concerned about developments in the region and uncertain policies of other countries . . . We confront common enemies. At this critical time for the Middle East cooperation between us is vital”. In this way, Turkey seems willing to enter actively into the hornets’ nest that is the intra-Islamic Cold War. At the same time, Turkey has also recently stationed some troops in the Bashiqa camp near the Iraqi city of Mosul. On Friday, 11 December, “Iraqi Prime Minister Haider al-Abadi instructed his foreign ministry to lodge a formal complaint at the U.N. Security Council over the presence of the Turkish forces, asking it to order Turkey to withdraw its troops from Iraq immediately”, as reported by Reuters. In response, Turkish troops started leaving the Bashiqa camp and moving north to positions close to the Turkish border (14 December). But now, the Turkish media report that the Kurdish news organization Rudaw, known for its close links to the Kurdistan Regional Government (KRG), has reported that the IS has staged an attack on Sunni positions in the area (16 December). 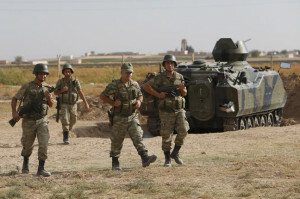 Turkey’s Armed Forces, then, declared publicly that during a confrontation between IS fighters and the KRG’s Peshmerga a number of KATYUŞA ÇNRA missiles, launched by the IS, struck targets inside the Bashiqa camp, wounding four Turkish soldiers who have since been moved to medical facilities in Turkey. Subsequently, the wily PM Davutoğlu used this incident to justify the Turkish military presence on foreign soil, stating that “[o]ur border security starts beyond the borders. It is difficult to fortify [our] security solely by means of precautions taken at the border[s themselves] . . . It is the decisions taken by the international community that have moved us to take precautions beyond the borders. Today’s picture shows that in the wake of a severe confrontation between the Peshmerga and ISIS in the vicinity of the Bashiqa camp . . . one of the Iraqi soldiers that are being trained has become a martyr [and] 4 of our [own] soldiers have been wounded. There is no cause for concern [now]. The Chief of our General Staff has taken control of the situation. ISIS positions in the vicinity have also been destroyed. This is also important to show the deterrent force [wielded by] Turkey. This development has demonstrated the correct nature of the steps that we have taken there. Our presence within the confines of Iraq’s territorial integrity”. AKP-led Turkey under President Erdoğan and wily PM Davutoğlu now seems serious about flexing its military muscle in its near abroad. On the domestic front Ankara seems equally bellicose, leading some to argue that Turkey is now on the verge of a civil war as “escalating clashes between Ankara and the Kurdistan Workers Party (PKK) have shifted to urban” centres, such as Cizre, Silopi, Şırnak, Nusaybin, Yuksekova, Şemdinli and the Sur district of metropolitan Diyarbakır (known as Amed in the Kurdish tongue). Ever since the ceasefire with the PKK evaporated last July in the wake of the arguably inconclusive elections earlier that month, the official rhetoric has been fierce. While Turkey appears willing to join the intra-Islamic Cold War on the international scene, domestically the country and its leadership remain terrified by any signs of Kurdish resurgence and continue to promote the ideals of Turkish nationalism, nowadays arguably tempered by a blatant Sunni component. 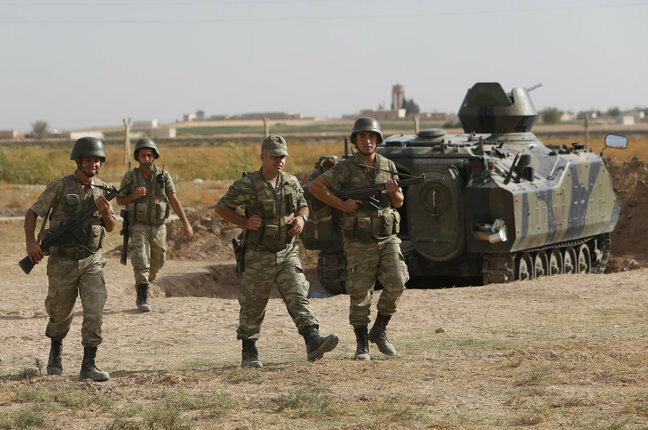 Turkey’s Armed Forces have killed six PKK militants in the province of Mardin since Friday (11 December), while on Monday (14 December), two men were also shot dead in Diyarbakır. The following day, clashes broke out in the city, leaving one policeman injured. A couple of days ago, then, numerous civilians started leaving the areas of Cizre and Silopi in droves before the imposition of a late night curfew. While, at the same time, armed vehicles and police and army troops were shipped into the affected areas, accompanied by 2 Sikorsky helicopters. A local resident by the name of Ömer Bilişik told the press that “[t]hose who have the means left the city. While those who do not have the means have started stockpiling foodstuffs. We do not know when the curfew will be lifted”. The military operation involves the deployment of 10,000 soldiers in a an attempt to “sweep” the area clean of terrorists. On its dedicated website, Turkey’s Armed Forces then posted the news that, on Tuesday, 15 December, eight PKK members have been “immobilized” (military jargon for killed) in the course of military “operations” in the Şırnak/Cizre area. 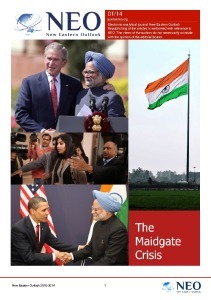 At a news conference in the capital, the wily PM said that “[s]ecurity operations are being conducted . . . We will turn all districts including Cizre and Silopi within this ring of fire into a place of peace, stability and freedom”. Davutoğlu then declared that Turkey “will not make concessions to terror and will not tolerate in any way these structures which are pawns of various foreign forces who want to drag Turkey into a dark future”. At the same time, Turkey’s Armed Forces have also started aerial operations to destroy campsites used by the PKK located within Turkey’s borders as well as inside the territories controlled by the KRG in northern Iraq. While these military actions are taking place, Turkey has also closed the main border crossing with the KRG, the Ibrahim Khalil border crossing point. In the end, one can but conclude that AKP-led Turkey under the dynamic duo of Erdoğan and Davutoğlu is now at pains to establish itself as a military force to be reckoned with, as if Atatürk’s dictum of “Peace at Home, Peace Abroad” has now been altered to really mean militarily secure at home as well as abroad or, if you will, War is Peace.